If you love fishing in the great outdoors and don’t mind packing in some gear, here are five unbeatable rivers with an abundance of fish in New Mexico. Take along your favorite lure, rod and reel and cast your line for that big one that always seems to get away! The wild and somewhat undiscovered parts of this river great for trout fly fishing have large populations of wild browns and rainbows. Large portions of it flow through high mountain forests and meadows and six miles runs right through the Chama River Canyon Wilderness area. Grab your waders and head for the area just below El Vado—that’s where the state record brown trout was caught. It may just still be there. One of the top five longest rivers in the United States, there’s plenty of fishing to do along its banks in northern New Mexico. Bring your most distinctive lures since the hard to access areas of this river have fewer fish overall, but they’re larger and feistier. Early fall, spawning time for the big browns, is the best time for this catch and release activity. You may just land a record setter. Hugging the state’s northern border with Colorado, this river is in a remote section of the Rio de Los Pinos Wildlife Area. With more than 20 miles of fishable river, you’ll find freestone water home to both brown and rainbow trout in riffles, pools and pockets of water just right for wading. Dry fishing best in summer. 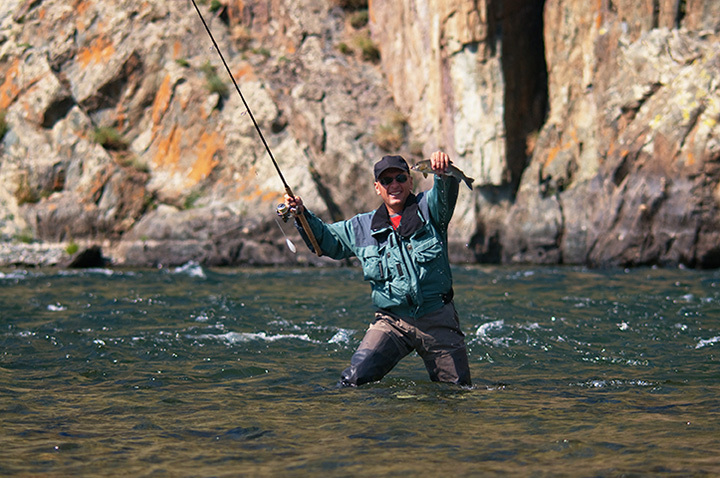 If you’re lucky, catch a brown trout in fall and you’ll get a vigorous work out landing it. Beautiful and fun for a day or longer. There’s a heathy population of insect life along this small river which flows out of the dam at Eagle Nest Lake. That means, great dry fishing, providing an up-close-and-personal experience with a fish. The river runs through canyons and meadows and is dotted with deep pools and shallow riffles. It supports a healthy population of wild brown trout which are poised near the surface, ready to take whatever bait you toss out. This is a network of rivers, the main being the Jemez, that provide a wide-range of fishing opportunities. You’ll find browns and Rio Grande cutthroats in great quantities. The streams my not be large, but the fish population is thriving. Hopscotch between mountain meadow streams and rocky seasonal freestone streams for a variety of experiences. Begin in March and spend the summer finding your favorite fishing hole. View more New Mexico Fishing Holes.